A subtly chic and modern table that proves to be a stunning storage and display solution. Display decorative items on this living room centerpiece, or use it to hold up coasters and drinks at your next gathering. 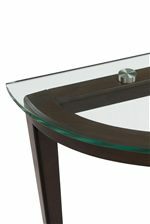 The Carmen Contemporary Wood and Glass Oval Cocktail Table by Magnussen Home at AHFA in the area. Product availability may vary. Contact us for the most current availability on this product. T3110-47B Oval Cocktail Table Base 1 48" 28" 17"
T3110-47T Oval Cocktail Table Top 1 48" 30" 0.47"
The Carmen collection is a great option if you are looking for Contemporary furniture in the area.